1. What is Html.TextArea and Html.TextAreaFor Helper Class? 2. What is the difference between Html.TextArea and Html.TextAreaFor method? TextArea is a multiline text input control that can accept a large number of string lines. Usually, size of TextArea is divided into rows and column and you can set it according to your needs. Html.TextArea is loosely typed text input control that takes string as parameter. This string may be or not same as model property. Because it doesn't bind string parameter with model property and not check for error at compile time so there can be a huge chance of getting a runtime error. Html.TextAreaFor() strongly bounded with Models properties. It checks input control at compile time and saves you from uncertain runtime errors. 2. Use lambda expression for accessing this model properties. 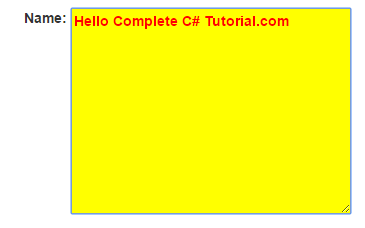 In this chapter, you learned Html.TextArea() and Html.TextAreaFor Helper Extension method in ASP.NET MVC 5 with complete programming example. I kept this chapter simple, short and easy so hopefully you will not get any problem in understanding this chapter. In the next chapter, you will learn about Html.TextArea() extension method.